...I have been out of town. This past weekend my brother graduated from college, so my boyfriend and I flew down to Atlanta to be with my family. I could not be more proud of my brother. We are very close in age which was a curse when I was young and a blessing now that I am older. My brother and I did not get along in the slightest when we were young. He was always teasing me, calling me names, and generally being mean. Then one day I moved to DC and when I went back to visit we were friends. I guess absence really did make the heart grow fonder. My brother truly is an amazing person and an even better brother. Anyway, this is why my post is delayed and why I have not been visiting with your blogs. 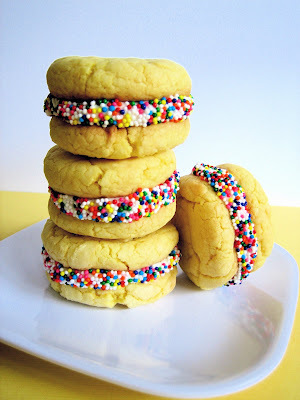 Don't worry, I am back to updating Baked Perfection and I will be visiting your blogs shortly. So on to these muffins. 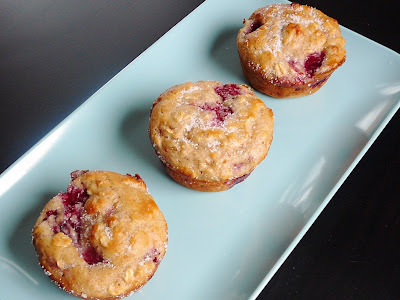 I bought a ton of raspberries and knew I wanted to make muffins. My friends and I decided we wanted to eat healthier, so I did all that I could to make this a "healthy muffin" and I think I did a pretty good job. I think each muffin has around 175 calories, but don't hold me to that count because I calculated it quite a while ago. These muffins did not taste one bit "healthy". They were moist, light, fruity, sweet, and had a nutty crunch. Everybody loved them and they were gone in no time. Preheat oven to 400ºF. Coat a 12-cup muffin pan with cooking spray or fill pan with paper liners. Combine flours, oats, 1/4 cup of sugar, cinnamon, baking powder, baking soda, salt, and chopped walnuts in a large bowl. Mix well, make a well in the center and set aside. Whisk yogurt, milk, egg, butter, vanilla and almond extract together in a small bowl. Fold mixture into dry ingredients until blended; fold in raspberries. Spoon batter into prepared pan, filling each cup about 2/3 full. 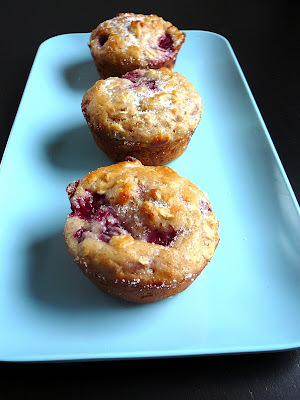 Bake for 20 minutes; sprinkle tops of muffins with remaining tablespoon of sugar. Bake until a wooden toothpick inserted in center of a muffin comes out clean, about 5 minutes more. Allow to cool in pan for at least 10 minutes; remove from pan and cool completely. Just like an Andes Mint. A few weeks ago I discovered the wonders of a great store, World Market. I am sure I am the last one to realize how great it is, but either way I am glad I did. I went there because I heard they sold spices at great prices which was definitely true. My cabinet is now stocked with all kinds of dried herbs and spices and it cost me a fraction of the super market prices. I was wandering around the food section at the store and came across some Guittard Green Mint Chips. They also had Cappuccino Chips, but since I am not a coffee person those did not appeal to me. I had heard great things about Guittard so I thought I would get the mint chips and would figure out something to make with them. Well I did not have to go far to find a recipe. It was last Sunday night and I had just finished making a pot of Gumbo. The mint chips were sitting in a basket I keep on top of my fridge filled with random baking items. I just kept looking at them and decide at 9pm on Sunday night I was going to make something. 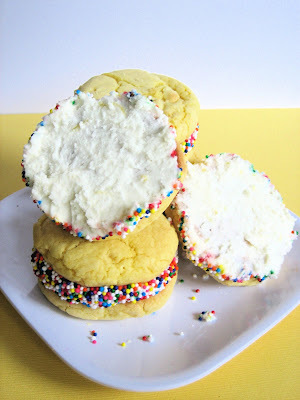 I grabbed the package and right on the back was a recipe entitled "Polka Dot Cookies". 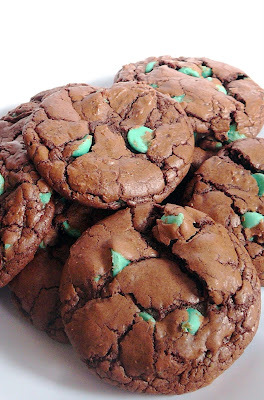 I am calling them Chocolate Mint Chip Cookies purely because it annoys me when you see the name of a dessert and it does not hint to what it is. Anyway, I followed the recipe exactly and they came out perfectly! 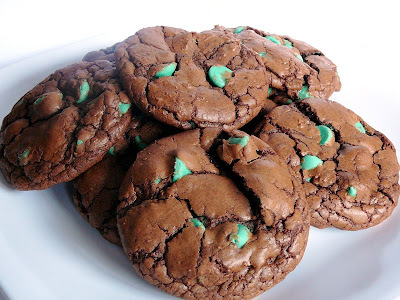 They almost had the texture of a brownie in a cookie form and the mint chips were smooth and creamy. After we tasted the finished product we thought this cookie base would be amazing with any time of chip. So if you want double chocolate toss in some chocolate chips. I wold love to try some peanut buter chips myself! I definitely want to try more Guittard products in the future. Preheat oven to 350 degrees F. In top of double boiler over low heat, melt the semi-sweet chips and butter, stirring constantly until smooth. Set aside to cool. In small bowl combine flour, baking soda and salt; set aside. In large bowl, beat eggs, sugar, and vanilla until light. Blend in melted chocolate then dry ingredients. Stir in green mint chips and chill for 10-15 minutes or until stiff. Drop by well-rounded teaspoonfuls onto greased cookie sheets. Bake 8-10 minutes; cookies will be soft inthe centers but will firm up as they cool. Yeilds approximately 4 dozen cookies.